Stop wracking your brains about what to give for a friend's birthday. Take Chef Pablo "Boy" Logro's word for it - give food. Irresistible food! 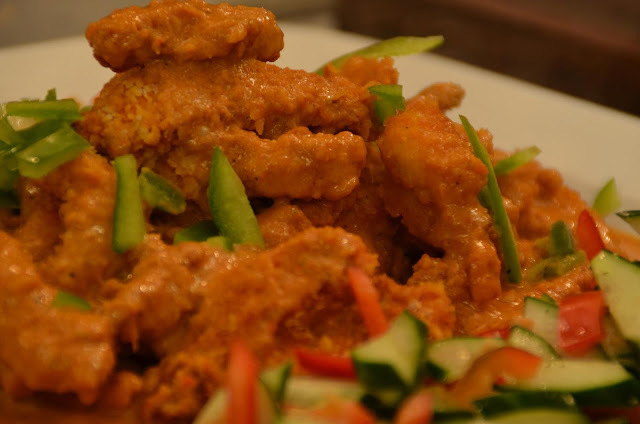 Like, Thai-Style Chicken Fingers with Peanut Sauce and Cucumber Salad is special enough to best express your special birthday greetings to a special friend. Starstruck graduates Ryza Cenon and Mike Tan are sufficiently impressed by the profound enchantment that this dish cooks up as they wolf down every bit of it. 2. For the chicken fingers, whisk together 1/2 cup coconut milk, 11/2 tablespoons curry paste and 1 tablespoon fish sauce or soy sauce in a shallow dish. Add the chicken and toss to coat. Cover and chill 15 minutes. Drain chicken, discarding liquid. 3. For the salad, whisk the 1/3 cup lime juice, salt and sugar together in medium bowl. Place cucumbers and red pepper in large bowl. Add dressing and toss to coat. Set aside. 4. Place the panko crumbs in shallow bowl. Dredge the chicken in the crumbs to coat both sides. Spread oil evenly in a jellyroll pan, and arrange chicken in a single layer in pan. Bake, turning halfway through, for 15 minutes, or until lightly browned and cooked through. 5. For the sauce, in a small saucepan over medium heat, combine 1/2 cup coconut milk, peanut butter, brown sugar, 2 teaspoons curry paste and 1 tablespoon fish sauce or soy sauce. Bring to a simmer and cook, whisking constantly, for 2 minutes. Remove from heat and stir in 1 tablespoon lime juice. 6. To serve, sprinkle the peanuts over the cucumber salad and serve with the chicken fingers and peanut sauce.